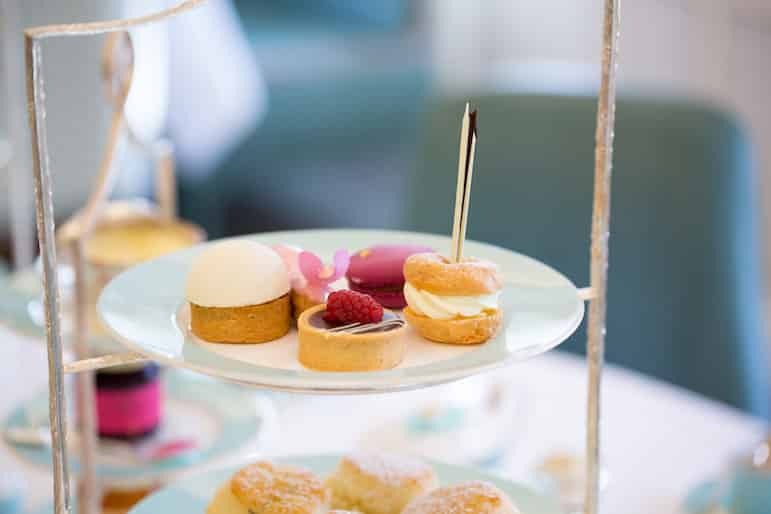 There is something always de rigueur when it comes to afternoon teas in London, and in recent years many of the city’s top establishments have introduced quirky twists on the quintessentially British tradition. And it’s a long running one too. In 1848, Anna, the seventh Duchess of Bedford, would feel very hungry in the afternoon. With a long wait until dinner at 8pm, to fill the void, she would ask for a tray of bread, butter and cake to be served at 4pm. As she started to invite friends to join her, it soon became a fashionable social event and so the afternoon tea was born. It hasn’t faltered in popularity and is one of the most traditional things to do in London. So why not continue the tradition for yourself – the best afternoon teas in London offer a cornucopia of delights from tea with homemade scones slathered in clotted cream and jam; to ever more artful, quirky sweet treats. 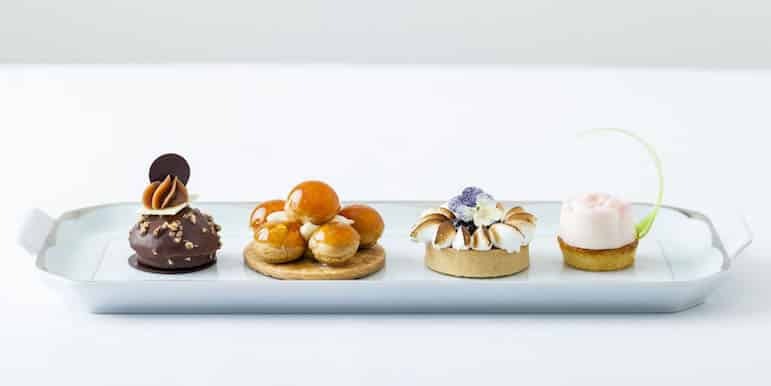 Here are some of the best afternoon teas in London to whet your appetite – from the traditional to the quirky. Know somewhere delectable you would recommend? Share it with us below. When you think of afternoon tea, it immediately conjures up images of finger sandwiches served fresh with simple, but tasty fillings like smoked salmon, ham, egg mayonnaise and the cucumber (yes, cucumber sandwiches are a popular feature of afternoon teas). But it’s not just about the food, as the following four establishments will attest. With tea connoisseurs and palate cleansers, afternoon tea has come a long way. 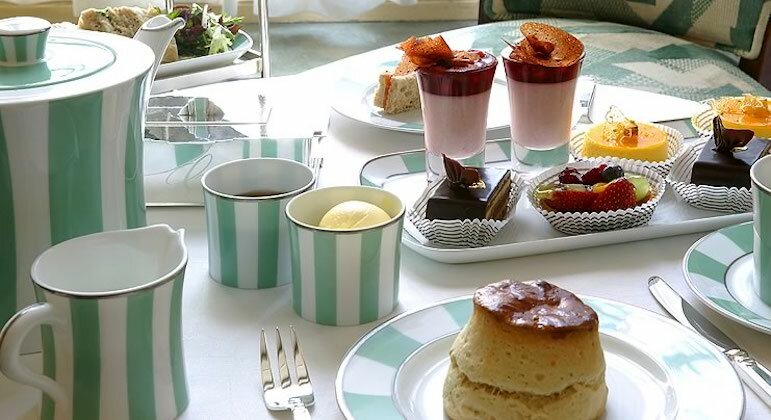 You’ll surely find one of best afternoon teas in London at Claridges, where they have been serving up tea time treats for more than 150 years. Tea, finger sandwiches, delicate warm scones and pastries are served in the magnificent 1930s Art Deco inspired foyer, making for very elegant surroundings in which to indulge. But the pièce de résistance is the tea itself. The hotel’s tea connoisseur, Henrietta Lovell, travels the world in search of the finest tea leaves to compliment the food perfectly, and there’s an enviable choice of teas as a result. Alternatively you can also upgrade to a champagne option. From £60pp. See a sample menu and click here to make a reservation up to 90 days in advance. Seasonal and charming define afternoon tea at The Dorchester, celebrating the very best in British heritage, since 1931. The prestigious hotel is also a member of the Tea Guild, so if you’re serious about your Earl Grey or Chai, this is the place for you. We especially love executive chef David Girard’s seasonal Flowering Tea palate cleanser – it’s delicate presentation and artisanal ingredients make it a rather special option. Or why not set a trend at the Spatisserie to extend your enjoyment of the finer things in life after a spa session at the hotel. From £55pp. See a sample menu or click here to make a reservation. Legendary hotel The Ritz is world famous for its trademark splendour and elegance. Dine in the refined surroundings of the Palm Court, featuring glistening chandeliers reminiscent of an Agatha Christie setting, and has 18 types of tea served in fine silver teapots, with mouthwatering sandwiches and pastries. And with a resident pianist and harpist to entertain you as you dine, The Ritz is made for special occasions, and equally special memories. From £54pp. See a sample menu or click here to make a reservation. Take afternoon tea at the Diamond Jubilee Tea Salon, inside the Fortnum & Mason store in Piccadilly. Priding itself on igniting the luxury food store’s signature sense of pleasure, it will be hard to decide if the tea or the food clinches it but their lemon curd scones are certainly a zesty twist on tradition. Have a special celebration? Count on Fortnum & Mason to bring something unique, with a personalised bottle of champagne to celebrate. From £44pp. See a sample menu or click here to make a reservation. Now we know you shouldn’t change things that are already quite spectacular – you only need to listen to some dreadful cover of a classic record to come to that conclusion. However when it comes to afternoon teas in London, allowances can, and indeed should, be made. 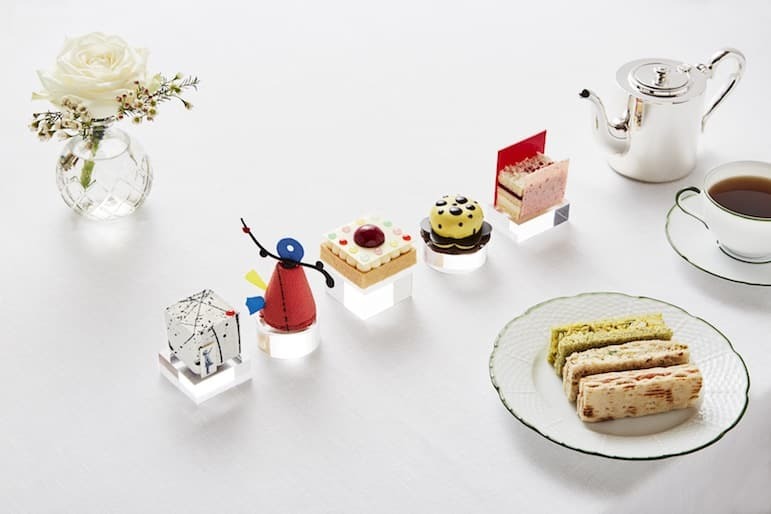 Here are four quirky afternoon teas, which retain the traditional refinery, but add their own fusion of modern art and fusion dining. Fusing tea and art may seem an odd combination, but celebrating the very best in British art through food actually makes a lot of sense. And this is something that Mark Perkins, executive pastry chef at the Rosewood was not afraid to play with. The result? A five treat visual and flavour spectacular, inspired by the works of Banksy, Mark Rothko, Damien Hirst, Yayoi Kusama and Alexander Calder. Served in the hotel’s Mirror Room. We especially like the sound of Banksy’s ‘Girl with a Balloon’, featuring a mix of white chocolate, vanilla cream choux, cherry jelly, hazelnut caramel and chocolate crémeux. From £50pp. See more or click here to make a reservation. 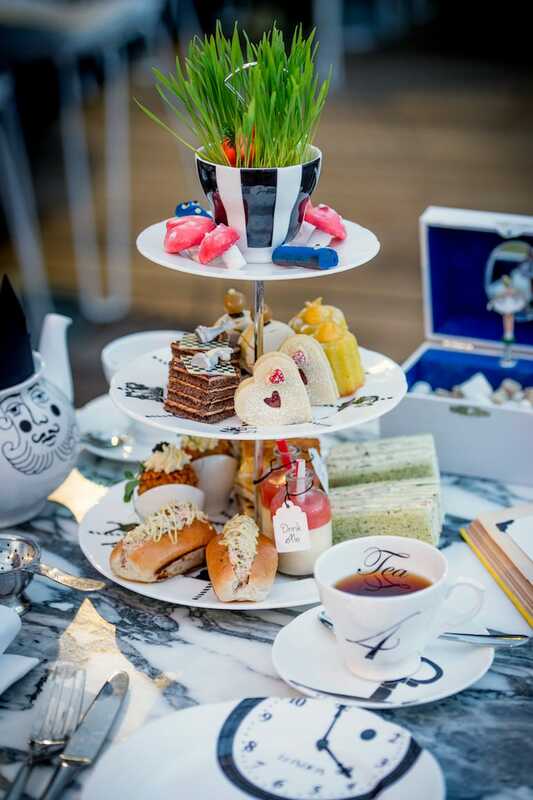 Fans of Charlie and the Chocolate Factory, and chocolate lovers in general will adore this bizarre afternoon tea served in the hotel’s lobby bar. With candyfloss, caramel chocolate milk and a blueberry brioche just some of the delights taken from the movie, One Aldwych uniquely blends a range of the freshest and finest ingredients modelled into the bonkers concepts created by children’s author Roald Dahl. One for the whole family, it’s a perfect way to introduce youngsters to the deep rooted British tradition of afternoon tea. Tea time treats just got so much more creative. From £39pp. See a sample menu or click here to make a reservation. 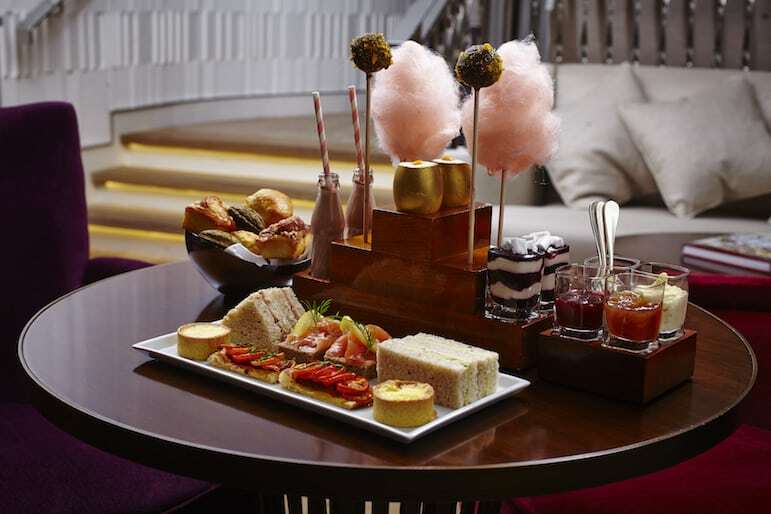 This five-star London hotel transports you to a world of magic with its Mad Hatter’s afternoon tea party. Starting from when you open your vintage menu, the line up includes unusual delicacies such as marshmallow mushrooms and carrot meringue. Whether you decide to ‘eat me’ or ‘drink me’, it’s a fabulous opportunity to give your palate a surprise. And for a boozy twist, the Tipsy Evening Tea is made for a grown up taste of Wonderland, with fun cocktail creations, and alcohol infused cakes served in the Courtyard Garden. From £48pp. See sample menu or click here to make a reservation. 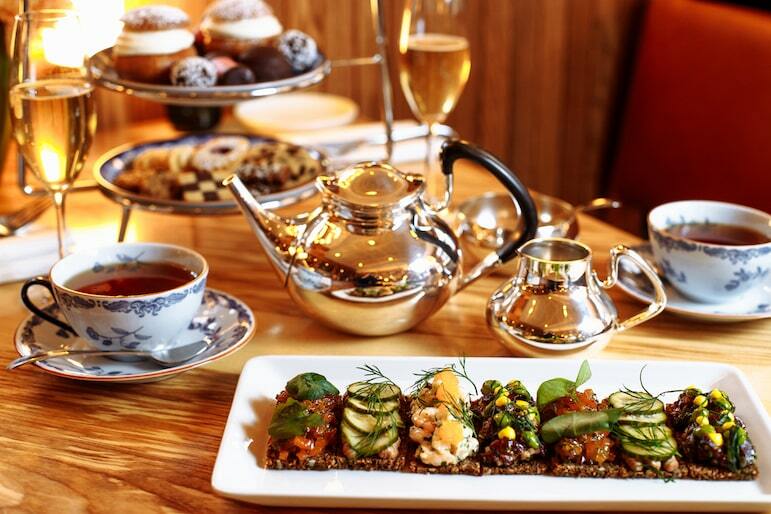 We’ve nicknamed this the Nordic tea, with traditional Norwegian food served in the style of a British afternoon tea. Aquavit is a contemporary Norwegian dining concept, inspired by its highly acclaimed sister branch in New York, where you can enjoy morning to midnight dining. Upgrade to the Aquavit Afternoon Tea and you’ll have four courses served on a Georg Jensen silver tea set, plus a glass of champagne for £65pp. Seafood fans will love the smorgasbord of shrimp and gravlax tartare, and the healthy infusion of sweets are the perfect introduction to Nordic cuisine. From £27.50pp. See a sample menu or click here to make a reservation. 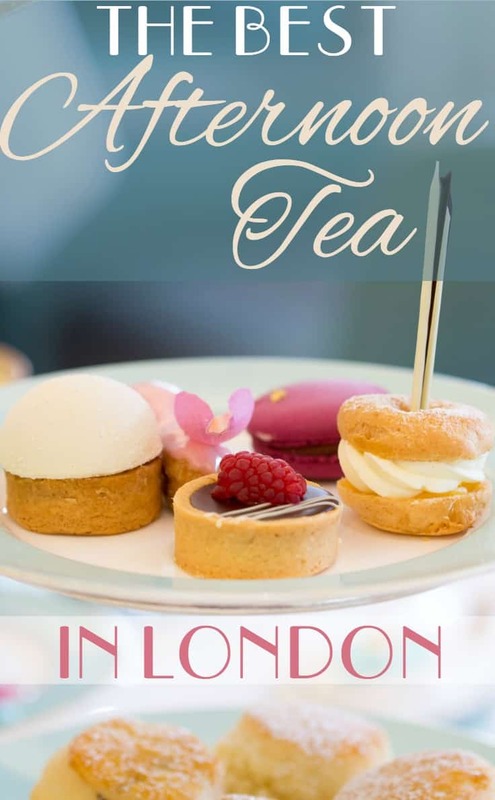 Whatever you choose or wherever you go in London, and whatever you may eat at any number of the city’s great restaurants, just be sure you don’t miss out on the best afternoon teas in London, they are a quintessential British delight. One Aldwych was so fun. Must come back to try a couple more. You must Janisse! 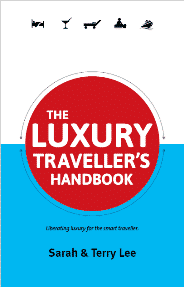 My favourite from this list is Claridges, but you know, The Ritz ain’t bad either. Oh my gosh these look amazing – I think I’m in love! I don’t think I can even pick between them – I’m literally just going to have to visit them all! I’ve been looking for places to take my mum to for her birthday and this is literally perfect – she will love love love all of these. I don’t know much about these kind of teas myself as I’ve only ever been to a sushi one (this one if people were interested: http://rofuto.co.uk/afternoon-tea/ ) and it was amazing but I really want to do the whole cream tea and finger sandwich thing as it looks so yummy and pretty! This is just honestly the biggest help ever though – my mum will just love all of these! So glad you found this post useful Isabel. I must admit we did have a bit of a drool fest when looking for the best options in London. Rofuto looks like a great alternative, might have to give that one a try the next time we’re in Birmingham. It’s always good to take some time out for afternoon tea – tea and finger sandwiches are simply the perfect combination! I hope you and your mum have a fabulous time for her birthday.